Amanda made it to the airport safely. Apparently they saw a taxi driver going down the wrong side of the road, which seemed crazy, but they made it in one piece nonetheless. 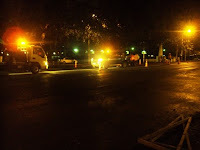 Walking home from the Peace Corps office after they left, I passed more road crews doing more work into the night. 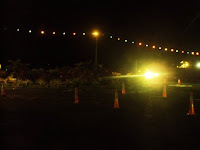 Cones still line the center of Beach Road and crews appeared to be just starting a long night shift. Comparing notes on the Road Switch, Supy and I agreed it seemed to go off without a hitch. Though neither of us had seen any news reports, neither of us had seen anything out of the ordinary. I feel like I should use the word “anticlimactic,” but I feel like that implies something negative, and the feeling here seems to be positive relief. Although in terms of relief, it’s one of those situations where there’s never going to be a feeling of total relief. Nothing terrible happened today, but what happens when people stop driving extra carefully and someone lapses into driving on the right side of the road? Or what happens Wednesday when people go back to work? If things go smoothly, can we start to feel total relief a month from now? 2 months? 6 months? Time will tell. Supy was talking about heading to the village this weekend, but he thinks there will be no buses since most buses haven’t been altered so the door is on the left side of the vehicle. I wonder how long it will take bussing to return to normal. All in all, my favourite part of all this is the sheer spectacle. 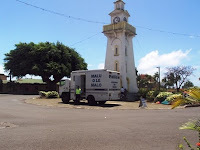 I saw more cameras this morning than I’ve ever seen in Samoa. 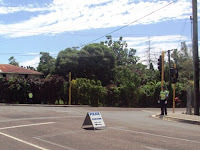 People lined the street from the fire station all the way to the roundabout—a distance around 200 metres. And this was at 6:00 a.m. Impressive. I was talking to a girl at church yesterday who attended university in New Zealand. She said she was far more worried about other drivers adjusting to the switch than she was about her own driving. She’s lived with left-hand drive, so she’s familiar with the mindset. I never have, and I am not. It’s all a little baffling, and I wonder how long it will take before I’m used to it. Time will tell. 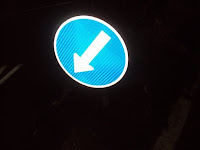 Many right-side arrows have been painted black. I walk around this puddle a lot, where there's clearly no sidewalk. I have to watch for oncoming traffic from the opposite direction, which I did shortly after the switch this morning. And it felt really weird. It was such a spectacle, this family showed up at 6:00 a.m. with a full-on picnic breakfast. It was an impressive little spread. 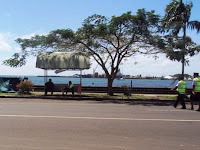 It's a lazy Monday around Apia with most of the country shut down on account of the Road Switch. The place isn't completely dead, and there are a fair amount of cars on the road. Police are stationed at key intersections around the city, but most are sitting in the shade observing more than anything else. 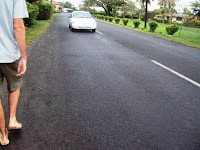 Flow of traffic seems to be slightly slower, but drivers tend to drive slowly here, and the difference is negligible. Most businesses are closed because of the national holiday but a few are bucking that trend. Farmer Joe is open, which isn't surprising because Farmer Joe is open on Sunday. Mari's Faleoloa and Italiano Pizza, which normally open late in the afternoon on Sunday are both open today. More surprising is places like Daphne's Cafe, which is open and seems to be ignoring everything outside the normal routine. There was a moment when I went to cross an intersection that was confusing back in the right-hand drive days. 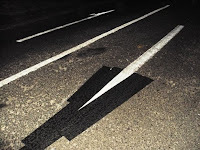 I looked for oncoming traffic, and then stepped out into the crosswalk, only to hear a car wailing its horn at me coming from the other direction. 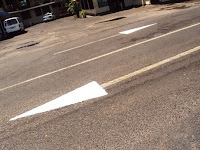 Freshly painted bright white arrowheads look a little silly on dingy, dirty white lines. This bus stop is acting as a temporary first aid booth. 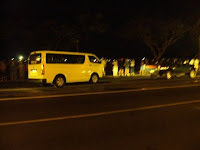 Police camped out at the roundabout. 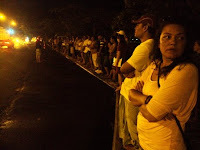 Crowds turned out along Beach Road to watch cars freeze, move to the left side of the road, freeze again, and start moving once more. 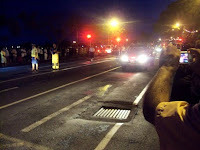 The Prime Minister's speech was broadcast to the crowd over loudspeakers and carried over radio as he addressed drivers directly. 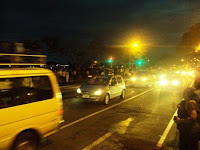 There was cheering and applause as he called on drivers to switch, and air horns and sirens and car horns rang out at 6:00 a.m. Traffic lights, which have been shut off for the last three weeks were turned on to direct left-side drivers. Emergency crews and roadwork crews stood together as traffic began to move again. From a PR standpoint, the switch seemed nicely timed so that the sun began to rise just as left-side traffic began rolling through intersections. 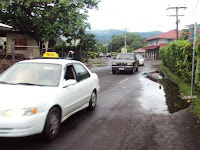 The metaphor of the new day in Samoa was hard to miss. Maneuvering the switched roundabout became a spectator sport. Crowds looked on as drivers began circumventing the clocktower clockwise. Everything went like clockwork. Heyo! 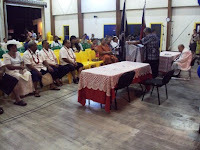 Prime Minister giving speech. Head of State sitting behind him (at right). Van switching from right to left. Cars starting to roll down the street on the left side. Traffic moving slowly as news cameras and police watch. 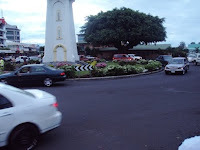 Cars moving clockwise through roundabout. Soles on the seawall came out to see the spectacle. It poured all day yesterday, which must have screwed up the plan for the road crews to do the last-minute transitional road work to be ready for tomorrow. 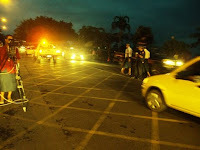 The rain let up around 8:00 p.m., and road crews were immediately out and about along Beach Road, painting and converting infrastructure to accommodate left-hand traffic. 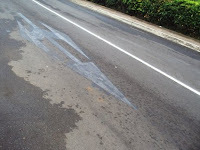 There's a lot of cognitive dissonance in watching cars drive on the right side of the road while many roads are already painted for driving on the left. Traffic is at a minimum in these final hours before the big switch at 6:00 a.m. 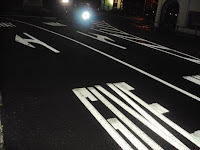 Arrows that have been painted are covered with black tape, which can be easily removed in the morning. Lots of signs have been posted to face oncoming traffic on the left side of the road including speed limit signs. 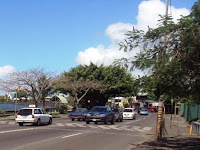 Until today, I'd never seen a posted speed limit in Samoa. We're planning on walking out to see what's going on around town at the actual moment of The Switch, and my plan is to update this post throughout the day today. Arrow guiding traffic to the left. Last few cars driving on the left. Arrows covered in black tape. Thanks for the awesome updates Matt. This is the best running commentary on what is going on on RS-DDay..Keep up the great work. And give a Amanda a hug for me. Thanks for the updates. Now we overseas can rest assured that all is well in paradise. Still..what a crazy idea! 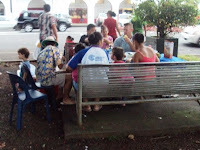 As they all say,"only in Samoa". ditto to the other comments, your blog was the best update i had on the switch :) faafetai lava Matt! good luck and be careful good to know your sister got to the airport safely. Thanks for the interesting photos on the road switch. I must admit shock at seeing your photo of the dual-unit speed limit sign, though! This is quite bizarre. One would think that if the government is switching sides to promote the importation of right-hand drive cars from Pacific nations (all of which use the metric system exclusively, so speedometers are km-only), promotion of metric-only signage would make more sense (existing US-made vehicles should have dual-unit speedometers, so km/h-only signage would be fine). 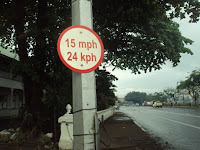 Perhaps these signs are temporary for the period of reduced speeds? It's interesting (and sad?) to see that the UK is not the only country with muddled measurements (we are mainly 'metricated', but the road signs are largely imperial, yet fuel is sold by the litre!). It's a mess. Ireland completed the changeover in signage four years ago, and I wish we would do the same.